Well it seems to have gone under the radar today, but on this day The Living Daylights was released in the United States in 1987. 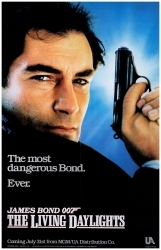 It was the fifteenth James Bond film and the first of two to star Timothy Dalton as James Bond. In the UK the film was premiered on July 29th at Odeon Leicester Square in London. TLD is a great film.. still today! I remember also my first screening in London! I remember seeing “The Living Daylight first Day when it was release in Australia in November 1987. I did enjoyed it alot. Timothy Dalton debut as James Bond 007 & Marayam D’Abo as the Bond girl & James Bond return in an Aston Martin with 2 Audis he drive in the screen. More Romance less gadget guns. But it was good. I enjoyed the love seen in the end, that was the best. I have the DVD.